Today we honor our Blessed Mother. In particular, we honor her Immaculate Heart just as we honored Jesus’ Sacred Heart yesterday. The two go hand in hand. The Heart of our Blessed Mother is a sign of her perfect love for us. It is “Immaculate” in that it is spotless and perfect in love. When reflecting upon the perfection of love, we also acknowledge that her love is the perfection of a mother’s love. This is a unique love of the highest order. A mother’s love is not just love of neighbor or a friendship. Rather, a mother’s love is such that it is completely invested, nurturing, sacrificial and total. This is the love our Blessed Mother has for us. Today is a good day to reflect upon whether or not you have allowed her to love you with this perfect motherly love. Have you consecrated yourself to her, choosing her as your queen and mother? 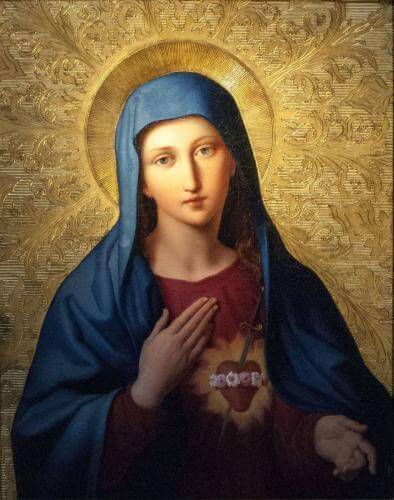 The Immaculate Heart, and therefore, the Immaculate love of our Blessed Mother is a glorious gift from God. She is the instrument through which Salvation Himself came into our world. She is also, therefore, the continuing instrument through which all the grace given by Christ comes into the world. She is the Mediatrix of Grace. Why does she have this role? Because God destined it to be so. God could have saved us any way He chose, but we must humbly and honestly acknowledge that the way He chose to save us is through the mediation of the Blessed Mother. God does not change His mind today. He chose her as the instrument of salvation over 2,000 years ago and He continues to choose her today. He continues to pour forth His grace on the world through her and she continues to distribute His love and mercy through her Immaculate and motherly Heart. Reflect, today, upon the beauty and perfection of the love radiating from her life for you. Run to her and make an act of faith in her motherly care. Consecrate yourself to her and let her be the instrument God wants her to be. Hail Mary, full of Grace, the Lord is with you. Blessed are you among women and blessed is the fruit of your womb, Jesus. Holy Mary, Mother of God, pray for us sinners now and at the hour of our death. Amen. Immaculate Heart of Mary, pray for us. Jesus, I trust in You.